All the Birds in the Sky, on its surface, is a story about two weirdos who come of age and fall in love during an apocalypse. It’s a story infused with magic, from the first time we see Patricia talk to a bird, and it’s a story about bad timing, from the moment Laurence makes his first two-second time machine. It’s a comedy of errors about the end of the world, and it’s one of the most wonderful things I’ve ever read. I’m only a little disappointed to have read it so early in the year. I feel about All the Birds in the Sky the way I felt about N.K. Jemisin’s The Fifth Season (which this novel is absolutely nothing like) last year; I just know, deep down, that nothing else I read in 2016 is going to top it. In Patricia and Laurence, Charlie Jane Anders has created a pair of compelling and dynamic protagonists who are in perfect balance with each other. Patricia learns at an early age that she’s a witch, and Laurence is doing advanced tinkering in first grade. By the time they are in middle school, they’re both decidedly outcast by their peers and bond over that shared status even though they are otherwise nearly polar opposites. However, Anders avoids stereotypes and simplistic characterization in her depiction of her leads. Laurence and Patricia are both grandly archetypal and intensely real, and their story is at once epic and deeply personal. Anders also peoples the world that Patricia and Laurence live in with a diverse cast of characters, from their two very different but equally dysfunctional families to their mentors to their adult friend groups who turn out to have more in common than not. There are talking birds, an AI, a tree spirit, and even a time traveling assassin/guidance counselor who ends up being one of the funniest characters in the book. While, on one level, all of these secondary and tertiary characters are arrayed like chess pieces, again Anders avoids drawing the battle lines too clearly, creating an interesting, nuanced dramatis personae. The story meanders between fantasy and science fiction towards a climax that combines the best of both to excellent effect. The plotting and pacing are consistently good, and the tropes Anders utilizes are well chosen and smartly combined. When she chooses to subvert the reader’s expectations, it’s done in a way that is obviously very clever but never veering into twee territory. All the Birds invites the reader to play along when other less deft works might simply toy with the reader’s emotions. There’s plenty in this book that is unexpected, but there’s enough of the familiar to make it feel like an old friend that you’ll want to visit again and again. It’s a strange book to review because I don’t want to give too much away, but also because I’ve never read anything quite like it. All the Birds reminds me most of Neil Gaiman and Terry Pratchett’s Good Omens, albeit vaguely, and it objectively has very little in common with that book outside of the fact that it also deals with an apocalyptic event and was quite funny. 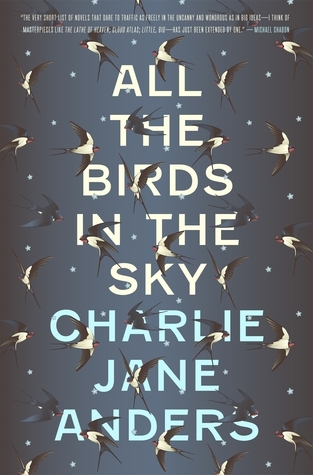 The truth is that All the Birds in the Sky is a wonderfully unique and fabulously original novel that isn’t really quite like anything except itself.